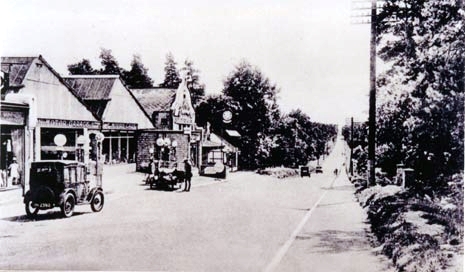 The original military cemetery was on the west side of the A325 where the Woolmer trading estate in now. The cemetery gates still remained after relocation of the site until the trading estate was built. Curiously, there is no evidence that it was ever used, and the mother of the late John Ellis said that it was never used. All descriptions of military burials at this time indicate that the deceased were buried in either Headley or Greatham churchyards. In March 1908 it was reported that good progress was being made with a new cemetery and that shrubs had been planted. This new cemetery was opened in April 1910 in Bolley Avenue amidst the pine woods. It was consecrated when the Chaplain General to the Forces, the Rt. Rev. Bishop I. Taylor-Smith CVO DD performed the ceremony assisted by Rev P.P.Raymond, Senior Chaplain to the Forces, Aldershot. Brigadier General F.Hammersley GOC Bordon Command was present and the cemetery was surrounded by troops representing each of the various units of the garrison, whilst musical portion of the ceremony was led by the band of the 3 rd Battalion Rifle Brigade. This burial ground is for serving members of the Regular Forces and their dependants. 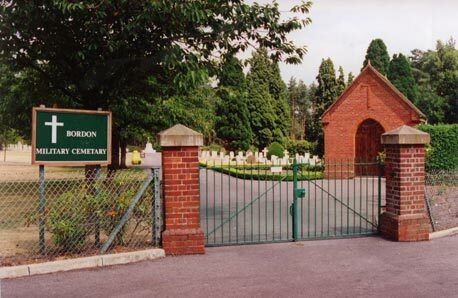 Many Canadian and South African soldiers who served in Bordon during the two World Wars are also interred here, as were nine American soldiers whose bodies were later returned to America. Separate areas are set aside for the various denominations. For a long while there was a solitary grave in the east corner for No. 16831 Private Jacobus Henry Darlew of the 2 nd Regiment South African Infantry, who died on 30 th September 1918. It was long speculated that either he was a suicide or a black man. Major Reed solved the mystery of why he was alone, when he discovered that he belonged to the Dutch Reformed Church for which there was no reserved plot. There is now a companion grave of a Gurkha, so he is no longer alone. There is also a grave in the cemetery of Mrs Alice Emily Chandler, the only civilian to be killed in Bordon by a falling enemy bomb on 16 th August 1940. She lived in Station Road in the old Coachman's cottage, where the coachman who had driven the horse-drawn fire tender had lived. The siren for an air raid was sounded but she went back into her house to retrieve her canary. Unfortunately, the bomb was then dropped and it landed on her house demolishing it and killing Mrs Chandler. A Canadian Officer and two NCOs were also killed during this raid and the stables at the fire station were set alight.